President Trump unleashed on James Comey Sunday morning in a ferocious tweetstorm and even threatened the former FBI chief with jail for leaking classified information. James Comey fired off a tweet a few hours later and Trump supporters on Twitter torched him. Excerpts of the book have made their rounds ahead of the April 17 release date. Comey personally attacked President Trump by trashing his marriage to First Lady Melania and poked fun at his appearance. Sunday morning Trump hit Comey hard and even threatened him with jail. Round 2: Comey throws AG Lynch “under the bus!” Why can’t we all find out what happened on the tarmac in the back of the plane with Wild Bill and Lynch? Was she promised a Supreme Court seat, or AG, in order to lay off Hillary. No golf and grandkids talk (give us all a break)! Round 3: I never asked Comey for Personal Loyalty. I hardly even knew this guy. Just another of his many lies. His “memos” are self serving and FAKE! Round 4: Slippery James Comey, a man who always ends up badly and out of whack (he is not smart! ), will go down as the WORST FBI Director in history, by far! No Bible verses or cryptic philosophical quotes this time around, Comey? Comey tweeted: My book is about ethical leadership & draws on stories from my life & lessons I learned from others. 3 presidents are in my book: 2 help illustrate the values at the heart of ethical leadership; 1 serves as a counterpoint. I hope folks read the whole thing and find it useful. Comey’s sit-down interview with sycophant George Stephanopoulos airs Sunday night at 10 PM EST on ABC. Trump supporters on Twitter torched Comey. YOU’RE A LYING MONSTER AND SHOULD BE PROSECUTED TO THE FULL EXTENT OF THE LAW. You are going to prison James . Ethical leadership? That’s rich coming from you. Even the rank and file @FBI are appalled and ashamed of you. You live in your own head like @HillaryClinton Looking forward to your prosecution for treason, cover ups, leaking classified info. Everyone is going to boycott this publisher they are a disgrace just like the criminal telling his corrupted lying disgraceful lies and everyone one should boycott ABC Fake News they will do anything for ratings they are slapping the ranking FBI in the face! 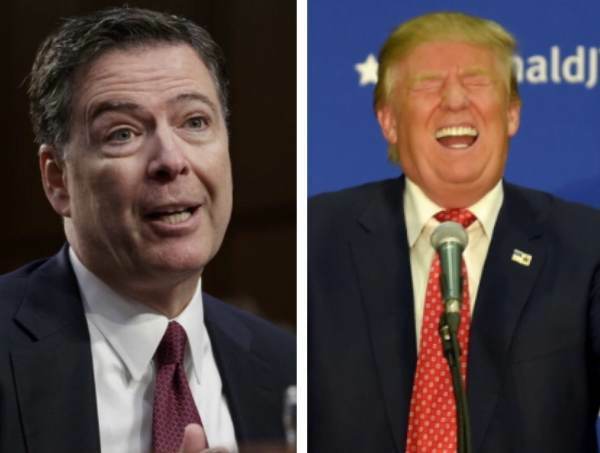 The post Comey Fires Off Tweet After Trump Threatens Former FBI Chief With JAIL – Twitter Responds appeared first on The Gateway Pundit.